All of the content on our websites and in our brochures are subject to trademark, service mark, trade dress, copyright and/or other intellectual property rights or licenses held by Le Cache® or one of its affiliates. The content on our websites and in our brochures are intended solely for personal, noncommercial use by the users of our site. You may download, copy, print and store selected portions of our content provided you 1. use these copies of the content for your own personal, non-commercial use, 2. do not copy or post the content on any network computer or broadcast the content in any media, and 3. do not modify or alter the content in any way, or delete or change any copyright or trademark notice. No right, title or interest in any downloaded or copied materials is transferred to you as a result of any such downloading or copying. Le Cache reserves complete title and full intellectual property rights in any content you download from our websites or copy from our brochures. From time to time there may be information on our websites or in our brochures that contains typographical errors, inaccuracies or omissions that may relate to product descriptions, pricing, and availability. We reserve the right to correct any errors, inaccuracies or omissions and to change or update information at any time without prior notice. We have endeavored to photograph and display the colors of our products as accurately as possible. However, our products frequently have variations in color and shade, and we cannot guarantee that the images shown on our websites or in our brochures will match your wine cabinet. Your privacy and the protection of your personal and financial information is important to us. We use the information that we collect on our site to provide you with superior shopping and customer service. If you place an order with us, your information will be processed in an accurate, secure and timely manner. When you place an order with us, we ask you to provide both personal and financial information. We use the personal information to ship your order to you, contact you about any issue involving your order, and occasionally send you information about our company and our products. We use the financial information exclusively for completing your transaction. We use the financial information solely to bill you for merchandise purchased on our site. We will never disclose your financial information to third parties, except where required by law or in order to provide you with a requested service. From time to time, we may send out emails on behalf of reputable organizations whose products or services are complementary to what we offer. We do not sell or share email addresses with any third-party. All of your private financial information is secured using 128-bit encryption, which safely encrypts the data before it is sent to us. To prevent unauthorized access and maintain data accuracy, we have procedures to safeguard and secure the information that we collect online. This site and all contents of this site are provided on an "as is" basis without warranties of any kind, either express or implied, including without limitation warranties of title or implied warranties of merchantability or fitness for a particular purpose. You acknowledge, by your use of this site, that your use of this site is at your sole risk, that you assume full responsibility for all costs associated with all necessary servicing or repairs of any equipment you use in connection with your use of our site, and that Le Cache shall not be liable for any damages of any kind related to your use of this site. If you have any questions or concerns about our privacy policies, please call us toll-free at 1.877.532.2243 or click here to contact us via email. 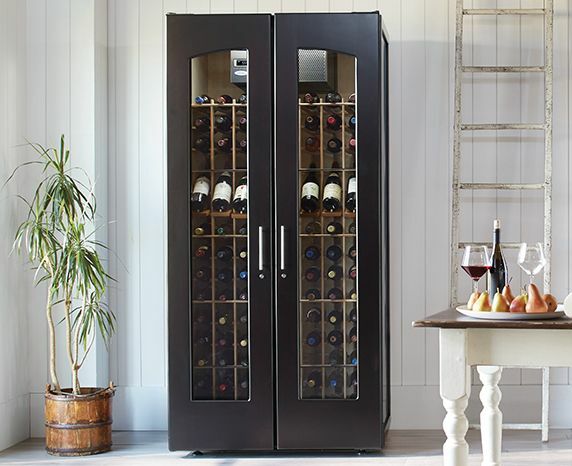 Let us help you with selecting, sizing, and configuring your wine cabinet. Restaurants, resorts, and hotels around the world use our cabinets—which are even more beautiful in person!